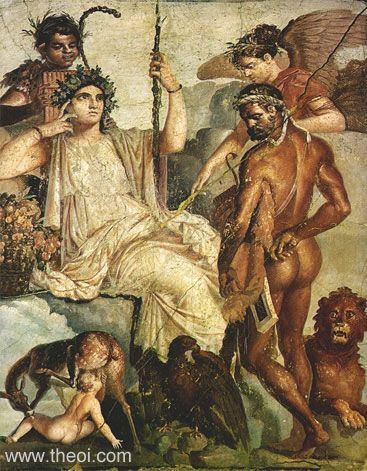 Heracles serves the Lydian queen Omphale as a slave. She is seated on a rocky throne flanked by an eagle and a lion, and is crowned with a wreath and holds a vine-wrapped sceptre. The hero stands naked before her with his lion-skin cape tucked under an arm and a sword sheath at his side. He is accompanied by the winged goddess Nike (Victory). Heracles' infant son Telephus suckles on the teats of a dow below the queen, and the god Pan, or a Satyriscus (boy Satyr), with a set of panpipes peaks down from above.